National Farm Safety and Health Week is September 20-26, 2015. This year’s theme is “Ag Safety is not just a slogan: it’s a lifestyle”. UMASH initiated a Pledge campaign from August 1st through September 30th, 2015 as part of National Farm Safety and Health Week. Live it – and Live! Nationwide started their focus on Rural Road Safety website this year as part of the We Stand For You initiative. Through the session you will learn about problems faced today on the rural roadways and items to be considered for increased safety on the rural roads. The discussion will cover some of the more common situations on the rural roads and how to best handle those situations along with other miscellaneous safety tips to consider when traveling on the rural roadways. The Manure Pit Safety program is intended for workers and managers in agriculture. This includes Pumping companies, farm operators and workers and agriculture business owners. The major focus of the program is safety in confined space work areas. Wednesday, September 23 -- Harvest Season: Are the Children Safe? Keeping children safe while they live, play and work on farms can be challenging. It’s even more difficult during harvest season, peak time for agricultural injuries. Each year, news headlines tell grim but preventable stories of death and injury. Non-working children, ages 6-and-under, are particularly vulnerable. AgriSafe is dedicated to training health and safety professionals who are prepared to serve the unique health care needs of agricultural communities. 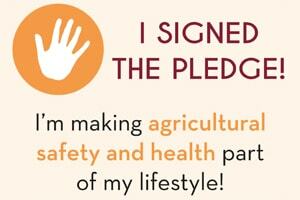 This week AgriSafe intends to engage rural health advocates in recognizing the prevention of farm injury and illness. Over the past decade, the ROPS Rebate Program has developed into a highly successful model for preventing tractor overturn fatalities. Despite this, expanding the program to provide services to farmers across the US has proved challenging due to the limited availability of financial, human, and other resources. In 2014, the National Tractor Safety Coalition (NTSC) was formed, and came together to develop a strategy for SCALEing up the ROPS Rebate Program and gathering the resources necessary to do so. This presentation will discuss efforts of the NTSC thus far and share plans for translating the ROPS Rebate Program into practice across the US.